You are a business owner and are busy running your business to (hopefully) the best of your ability. 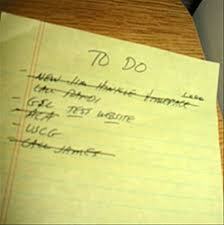 You do up a To-Do list and then try to stick to it as best you can. However there are days when you go over the things you managed to get done and the things you simply did not get time to do, so you re-allocate those uncompleted tasks to another day. How does not completing those tasks make you feel? I know I used to get a sense of dread when I was going over my to-do list at the end of the day, once I implemented it, instead of just writing one and ignoring it altogether, because I knew I wouldn’t have everything on it completed, which would lead to a sense of failure. Then I learnt to write a realistic to-do list and make each task a manageable one so that I wasn’t dreading doing it, even if it was one that I didn’t particularly like doing. I also learnt to slot the particularly horrible tasks between two really nice ones, almost like a building up a reward system. Many people have written on the subject of time management and to-do lists so I’m not going to yak on about them again, you can do a Google search to find relevant blog posts to get their messages. Instead I want to ask you about your focus. Where are you directing your focus? Remember we get what we focus on most. How is it serving you? Most importantly, what is letting it drift in the wrong direction costing you in your business…and your home life? How many extra potential clients have you not currently got because you allowed your focus to drift to something else and didn’t manage to get back to that particular task? How much revenue has that not brought into your business as a result of losing your focus for what seemed like only a few minutes? How much extra pressure are you now feeling to get done those tasks that you might and most probably would have completed if you had kept your focus on the particular task you had allocated to that time? Have you now got to take time away from your family and friends in an effort to just catch up because you changed your priorities after you’d made your to-do list and focused on something else? “The money is in the list” is a favourite saying of most internet marketers. It can also be applied to a to-do list as well. For when we make a list and write it down we then prioritise for a reason. Sticking to that list until it is completed not only gives a great sense of personal and professional satisfaction, it frees us up to be switch to another task that will help our business grow. Sticking to that list will also better enable us to switch off our business focus and switch on our home-life focus. Avoid having to ask yourself those uncomfortable questions by sticking to the list and fixing your focus to the tasks in the order you set them out. Where have you found that your floppy focus has cost you? What steps have you taken to correct that? More importantly, having fixed your focus, now, how do you feel? « You Might As Well Quit…! I agree, focus can make all the difference. So often I find that we can be busy being busy yet that action does not actually move us towards what we want. I often speak to individuals who have trained in a particular area and want to set up their own business. They often tell me that they want to have paying clients yet when questioned they are taking lots of action but none that actually focuses upon actually connecting with a paying client. Lol, I remember it well Jen. It is often a seriously steep learning curve that a lot of new business owner go through, one I help as many to avoid as possible these days. You are so right about implenting a reward system. We are people – not machines – but sometimes we beat ourselves up for being human.